This is an incredible soundboard recording from late 1991 during the Lactating Purple tour! It's so good that I decided to put it up on the site for download. The sound quality is pristine and the setlist speaks for itself. Everything is nice and audible, including the vocals and especially HELIOS' GUITAR! Sometimes his guitar is buried in the mix on other soundboard recordings, maybe something to do with the fact that he plays so LOUD when he performs.... but not on this recording, here we get to hear it all. 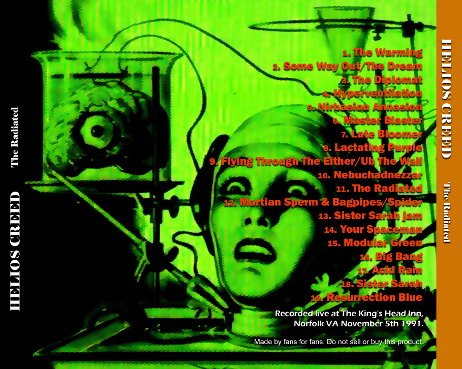 The entire Lactating Purple record is played as well a bunch of other songs in a massive setlist and full show! I believe this is probably one of the best live periods, in my opinion. Lots of energy with the show and this soundboard is quite a rare find. Put it on and watch the walls melt around you, this recording just SHREDS!